What happens when you take a BMW's flagship 7-Series, upgrade the interior, drivetrain, wheels, suspension, and let depreciation take its course? You end up with a great example of an absolutely epic drive - the Alpina B7, for the price of a Ford Focus. Alpina, despite being an official partner of BMW, isn't an considered an official car manufacturer in the US. This means that they take existing models, such as the BMW 7-series, and modify them extensively, and let BMW sell them as factory models, with full warranties. 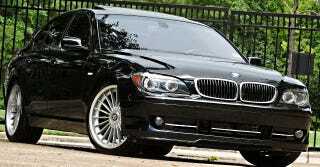 This BMW Alpina B7 comes with a 4.4 liter Supercharged V8, producing 500 horsepower. It's a little bit off the 7-series V12's power figures, but Alpina claims that this car is the fastest and most performance oriented of the 7-series lineup, as well as having the best weight distribution and value within the same market. The interior is adorned with standard BMW features such as heated, ventilated and massaging seats, power rear and side sunshades, and BMW's hate-it-or-love-it iDrive system. Alpina's gone in and redone the wood trim and put in accents all over the car, not limited to emblems on the steering wheel and changing the gauge cluster color to Alpina's trademark dark blue. The price for all this insane performance and luxury is a little over $25k, or best offer. I really can't think of any reason why not to get this, other than if you're a Mercedes AMG fan, like I am. Even so, I'd give this BMW a consideration as a cheap sleeper that looks like a million bucks.